The disease was supposed to be a relic of the dirty old days of coal mining. But it’s making a deadly comeback in Appalachia. 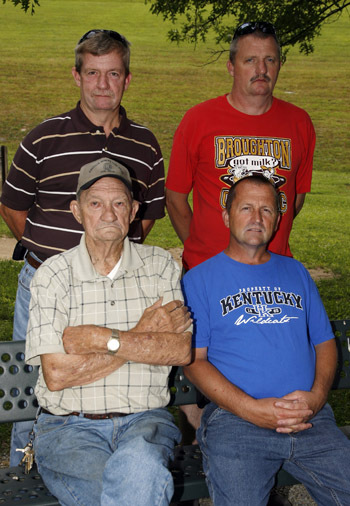 Retired Kentucky coal miner Ray Marcum (bottom left) and his sons (clockwise from top left) Thomas, James, and Donald. All four have a form of black lung. Photo by Center for Public IntegrityRay Marcum bears the marks of a bygone era of coal mining. 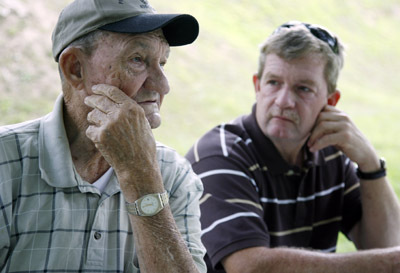 At 83, his voice is raspy, his eastern Kentucky accent thick and his forearms leathery. A black pouch of Stoker’s 24C chewing tobacco pokes out of the back pocket of his jeans. “I started chewing in the mines to keep the coal dust out of my mouth,” he says. Plenty of that dust still found its way to his lungs. For the past 30 years, he’s gotten a monthly check to compensate him for the disease that steals his breath—the old bane of miners known as black lung. In mid-century, when Marcum worked, dust filled the mines, largely uncontrolled. Almost half of miners who worked at least 25 years contracted the disease. Amid strikes throughout the West Virginia coalfields, Congress made a promise in 1969: Mining companies would have to keep dust levels down, and black lung would be virtually eradicated. Marcum doesn’t have to look far to see that hasn’t happened. There’s his middle son, Donald, who skipped his senior year of high school to enter the mines here near the West Virginia border. At 51, he’s had eight pieces of his lungs removed, and he sometimes has trouble making it through a prayer when he’s filling in as a preacher at Solid Rock Baptist Church. There’s James, the youngest, who passed on college to enter the mines. At 50, his ability to breathe is rapidly declining, and his doctor has already discussed hooking him up to an oxygen tank part-time. Both began working in the late 1970s—years after dust rules took effect—and both began having symptoms in their 30s. Donald now has the most severe, fastest-progressing form of the disease, known as complicated coal workers’ pneumoconiosis. James and the oldest Marcum son, Thomas, 59, have a simpler form, but James has reached the worst stage and is deteriorating. Men with lungs like the Marcums’ are not supposed to exist. In the hard-won 1969 law, Congress demanded that dust be controlled and new cases of disease be prevented. The idea was that even if black lung didn’t disappear there would be a small number of mild cases and virtually no one like Donald and James Marcum, said Dr. Donald Rasmussen, a pioneer in recognizing and diagnosing black lung. Throughout the coalfields of Appalachia, in small community clinics and in government labs, it has become clear: Black lung is back. The disease’s resurgence represents a failure to deliver on a 40-year-old pledge to miners in which few are blameless, an investigation by the Center for Public Integrity and NPR has found. The system for monitoring dust levels is tailor-made for cheating, and mining companies haven’t been shy about doing so. Meanwhile, regulators often have neglected to enforce even these porous rules. Again and again, attempts at reform have failed. A Center analysis of databases maintained by the federal Mine Safety and Health Administration found that miners have been breathing too much dust for years, but MSHA has issued relatively few violations and routinely allowed companies extra time to fix problems. MSHA chief Joe Main issued a statement in response to the findings: “The current rules have been in effect for decades, do not adequately protect miners from disease and are in need of reform. That is why MSHA has proposed several changes to overhaul the current standards and reduce miners’ exposure to unhealthy dust.” Similar attempts at reform have died twice before. From 1968 through 2007, black lung caused or contributed to roughly 75,000 deaths in the United States, according to government data. In the decades following passage of the 1969 law, rates of the disease dropped significantly. Then, in the late 1990s, this trend reversed. Many of the newer cases have taken a particularly ugly form. While rates of black lung overall have increased, incidence of the most severe, fast-progressing type has jumped significantly. These cases, moreover, are occurring in younger and younger miners. Of particular concern are “hot spots” identified in central Appalachia by the National Institute for Occupational Safety and Health (NIOSH), a government research agency. Though levels are still below what they were before 1970, medical experts and miners’ advocates are alarmed. The National Mining Association, the main trade group representing mining companies, disputes some of NIOSH’s data but agrees that black lung’s resurgence is a problem in need of attention. To the association, however, it is primarily a regional phenomenon of central Appalachia—one that doesn’t justify new national rules. What’s needed, the group says, is further study and better enforcement of current standards. Researchers are struggling to explain what, after years of progress, has caused the backsliding and why black lung, traditionally viewed as an old man’s disease, is striking younger and younger miners and robbing them of their breath faster and faster. They are trying to figure out why men like the Marcums are the new face of black lung. 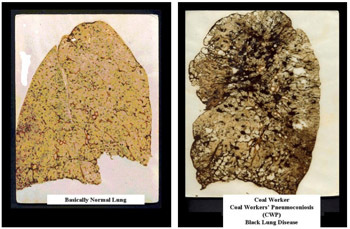 Black lung leaves miners’ lungs scarred, shriveled, and black. They struggle to do routine tasks and are eventually forced to choose between eating and breathing. His brushes with death aside, he’s here because he fears there may be one hazard he can’t dodge. “I come in here to file for my black lung,” he says. During a recent heart surgery, he says, doctors said they saw what appeared to be signs of the disease. He’s one of a handful of miners on an April afternoon to move through the RV parked at the fire department in Wharton, in the heart of coal country. Inside, a team of NIOSH workers shepherds them from station to station: medical history, questionnaire, breathing test, chest X-ray. Foster hopes the tests will provide evidence he can use to submit a claim for benefits. Other miners are still working and want to make sure their lungs are clear. It is from this rolling medical unit, in part, that NIOSH has documented the return of black lung. For decades, miners have been entitled to free X-rays every five years, and this has helped track the drop in the disease’s prevalence. After the data started showing a reversal, NIOSH sent its RV out to gather more data in 2005. What these researchers found, combined with data from routine medical monitoring, was worrisome: From the 1970s through the 1990s, the proportion of miners with signs of black lung among those who submitted X-rays dropped from 6.5 percent to 2.1 percent. During the most recent decade, however, it jumped to 3.2 percent. Even more disturbing: Prevalence of the most severe form of the disease tripled between the 1980s and the 2000s and has almost reached the levels of the 1970s. In a triangle of Appalachia—southern West Virginia, eastern Kentucky and western Virginia—the numbers were even higher. The rolling unit found a disease prevalence of 9 percent in Kentucky from 2005 to 2009, for example. A wake-up call for some came after the Upper Big Branch explosion in southern West Virginia in April 2010, which killed 29 miners. Of the 24 who had enough lung tissue for an autopsy, 17 had signs of black lung. Some had fewer than 10 years of experience in mines; they ranged in age from 25 to 61. The disease leaves miners’ lungs scarred, shriveled, and black. They struggle to do routine tasks and are eventually forced to choose between eating and breathing. There are theories about why the disease has returned, but no definitive answers. One likely explanation: Miners are breathing a more potent mix of dust. Coal seams are surrounded by rock, much of which contains the mineral silica. When ground up, silica is more toxic to the lungs than coal dust and can cause faster-progressing disease. With larger coal seams becoming mined out, companies are turning to thinner seams surrounded by more rock. At the same time, because of the price of coal and advances in mining equipment, it now makes more sense economically for companies to cut through large amounts of rock to get at the coal. Companies haul it all out and then separate the rock from the coal at processing plants. “In central Appalachia, you look at what’s coming out of the mines, and it’s probably 60 percent rock on a good day,” said Rick Honaker, a University of Kentucky professor who consults for mining companies and has seen their data. NIOSH research suggests this may be having an effect. A particular marker on a chest X-ray is often indicative of silica-related disease. Comparing miners’ X-rays taken from 2000 to 2008 with those taken during the 1980s, researchers found that the proportion bearing these markers had nearly quadrupled and, in central Appalachia, had increased almost eight times over. Rules are supposed to limit the amount of silica in the air in mines, but a CPI analysis of MSHA’s dust sampling database, obtained under the Freedom of Information Act, shows that the agency has long failed to control silica dust. In each of the past 25 years, the average of all silica samples—taking into account only those deemed valid by MSHA—has been higher than the allowed limit. Last year, for example, roughly 40 percent of the valid samples were above this limit. What’s more, the limit MSHA enforces is already twice the level NIOSH determined to be safe (PDF) in 1974. To the association, this means there is no need for a new rule on coal dust, just better enforcement of the silica standard. Another possible explanation for the uptick in disease: The number of hours worked by miners has steadily increased over the past three decades, MSHA data show. Ten- and twelve-hour shifts and six- or seven-day workweeks are now common. Longer hours mean more exposure to dust and less recovery time. The lungs can clear some dust by themselves if given the chance to recover, and many miners said in interviews that they often spit up a mixture of mucus and dust. At the same time, production has increased, thanks in part to powerful new equipment. A longwall shearer, for example, can carve out huge swaths of coal in little time. Donald Marcum knew he was at least a passive participant in something that was against the rules, maybe even criminal. Every couple of months, his bosses had to send MSHA five samples showing they were keeping dust levels under control. The man with the greatest potential exposure—often Donald because he was running a continuous mining machine, which chews through coal and rock and generates clouds of dust—was supposed to wear a pump to collect dust for eight hours. That almost never happened. Most of the time, he said, the mine foreman or someone else would take the pump and hang it in the cleaner air near the mine’s entrance. Seventeen of the workers killed in the 2010 Upper Big Branch mine disaster had signs of black lung. Some had fewer than 10 years of experience in the mines. When MSHA inspectors showed up to take their own samples, it wasn’t so easy to cheat. Donald would actually wear the pump, but he and his coworkers would mine only about half as much coal as they normally did, generating far less dust. “We just done what we was told because we needed to feed our families and really didn’t look at what it might be doing to our health,” he said. Donald’s experience echoed what CPI and NPR reporters heard from retired miners throughout West Virginia, Kentucky, and Virginia who had worked underground as recently as 2008. 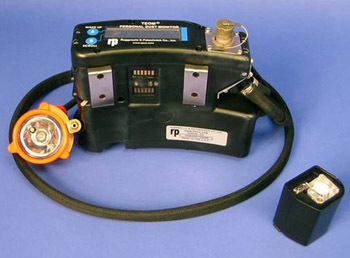 Dust pumps ended up in lunchboxes or mine offices. Mine officials stalled regulators who had shown up for a surprise inspection and radioed to the men underground, who fixed the ventilation and cleaned up the work site. It’s difficult to tell how widespread such practices are, but many former miners described some variation of cheating occurring regularly at almost every mine where they had worked—and a culture of fear fostered by the companies. “We always set and thought, you know, maybe if we didn’t do it this way, that they’d come in and shut the mines down. Then we’d be out of work,” said David Neil, a 52-year-old West Virginia miner with black lung who now drives a coal-hauling truck. Tim Bailey, a lawyer in Charleston, West Virginia, zeroes in on this type of cheating when he sues a coal company on behalf of a miner with black lung. In general, the only option for miners who get the disease is to file a claim with the state or the US Department of Labor to try to get benefits. But Bailey takes a different tack, drawing on a state law that allows workers to sue their employer in cases of knowing exposure to dangerous conditions. This often amounts to proving that the company manipulated its dust samples. In depositions, miners have described hanging dust pumps in cleaner air or getting advance warnings of inspections. Over the past eight years, he’s handled about 40 such cases. In each case, he said, the coal company eventually settled. Then there are the numbers themselves. For decades, the average sample submitted by a coal company has been far below the limit. NIOSH researchers used a formula to estimate the prevalence of black lung that would be expected based on the dust samples and compared this with the disease rates actually occurring. What the researchers found was surprising: The two didn’t match up at all. In some areas of the country, there was actually less black lung than they’d predicted. But in central Appalachia, the disease rates were much higher—more than three times the predicted levels in eastern Kentucky, for example. It was possible, researchers concluded, that the nature of the dust had become more potent. The other possibility: The dust samples reflected the results of rampant cheating. Many of the games described by miners today remain unchanged from those outlined by miners who testified at a 1978 MSHA hearing. The early 1990s saw the “abnormal white center” scandal, in which MSHA figured out that many coal companies had blown dust off the sampling filters, leaving a white center, before submitting them. This led to a spate of criminal convictions of companies and some employees and contractors. These composed the bulk of the 185 guilty pleas or convictions for dust sampling fraud between 1980 and 2002, according to data provided by MSHA to CPI and NPR. The agency refused to provide more recent data and wouldn’t say whether any criminal cases had been pursued since then. MSHA did provide data indicating that it had decertified 14 mine officials since 2009, pulling their authority to conduct dust samples. Cheating aside, the system for monitoring dust levels is almost designed not to detect problems. Nor has MSHA always been swift to act when violations do surface. From 2000 to 2011, MSHA received more than 53,000 valid samples—both from companies and its own inspectors—that showed an underground miner had been exposed to more dust than was allowed, yet the agency issued just under 2,400 violations, a Center analysis of MSHA data showed. This may be attributable, in part, to the way the rules are written. When companies submit five samples to MSHA, some are allowed to be above the limit. Only the average of these five has to be low enough, allowing companies to negate high samples taken from miners enshrouded in dust. What’s more, the pump runs for only 8 hours, even if the miner works 10 or 12. While an inspector is sampling, a company is allowed to mine as little as half the amount of coal it normally does. Companies that typically cared little about hanging curtains to keep air flowing through the mine or making sure water sprays used to suppress dust were working suddenly did when it came time to sample, several miners said. Sometimes MSHA has allowed dust citations to go uncorrected for weeks or even months, potentially leaving miners overexposed, a CPI analysis of agency data shows. MSHA sets a date by which a violation must be fixed, but, from 2000 to 2011, the agency granted extensions for 57 percent of the violations. Long extensions have been particularly common in southern West Virginia, one of the key “hot spots” of disease resurgence identified by NIOSH. In this area, which accounted for about 30 percent of the nation’s dust sampling violations, MSHA gave companies an extension about two-thirds of the time and allowed, on average, about 58 extra days to prove compliance. 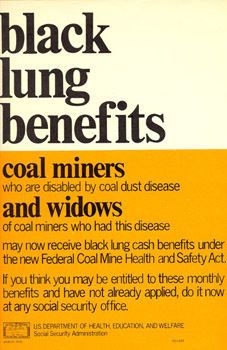 Even before the reappearance of black lung, the need for change was apparent. A proposed MSHA rule led to hearings in 1978, during which miners testified to widespread manipulation of dust samples. That proposal stalled and was withdrawn by the Reagan administration. In 1995, NIOSH reviewed the scientific evidence and concluded that the limits for both coal dust and silica should be cut in half and periodic medical exams for miners should be enhanced. 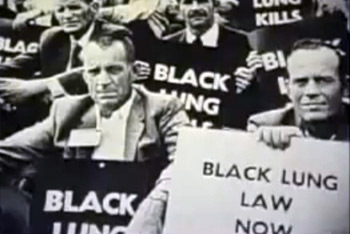 The same year, the secretary of labor appointed a committee to determine how to eliminate black lung. The committee’s report offered a roadmap for reform. It recommended that MSHA consider lowering the coal mine dust standard. It suggested the agency reduce miners’ silica exposure and establish a separate limit for this more potent type of dust. Samples should be taken while the mine was producing at least 90 percent of what it normally did, the panel said, and samples should be adjusted to reflect longer work shifts. In July 2000, MSHA proposed a rule that would have adopted some of these recommendations. Before the rule became final, though, George W. Bush took office, and the rule died. “It’s really fairly remarkable that we came up with these recommendations back in 1996 during a Democratic administration, and nothing has happened,” said David Wegman, who was chairman of the committee and is now an emeritus professor at the University of Massachusetts Lowell’s School of Health and Environment. History may be repeating itself. MSHA proposed a rule in 2010 that would cut the overall limit for dust in half and require companies to use continuous personal dust monitors, which would provide real-time measurements. The current pumps have to be sent to a lab, where analysis can take weeks. Under the rule, the samples would be weighted to account for shifts longer than eight hours, and companies could be cited for a single sample over the limit—rather than an average of five—or a weekly accumulation of exposure above a certain limit. The rule would also expand the free X-ray monitoring program to include lung function tests and medical assessments. In a strange twist, even industry favors MSHA’s taking over all compliance sampling. “We need to get to a point where we remove this cloud of controversy and instill in the minds of everyone that the samples are accurate,” the National Mining Association’s Watzman said. There isn’t much in the rule that the association supports, however. The real-time dust monitors—a centerpiece of the proposal—are still not accurate enough to be the basis of citations, Watzman argued. Dennis O’Dell, safety director for the United Mine Workers of America, said the few problems with the monitors are “little things that can be tweaked.” The union favors the proposed rule, though it would like to see portions of it changed. All of this may be moot. A presidential election is approaching, and many fear a change in administrations could mean what it meant in the early 1980s and the early 2000s: the death of reform. In coal country, weakness is a sin. Mining is just about the only career choice, and one generation often follows another underground. Convincing a miner to go to a clinic, get an X-ray or file a claim for benefits can be a challenge. “They’re not going to come and complain about how they feel, just because that’s part of our culture,” said Debbie Wills, sitting in the clinic in tiny Cedar Grove, West Virginia, where she helps miners get evaluated and file for black lung benefits. At the same time, fear is almost as deeply rooted. Many miners don’t want their employers to know they have signs of black lung—or even that they’ve been X-rayed. Anita Wolfe, who runs NIOSH’s surveillance program and is often out with the RV that screens miners, said she has seen men approaching on foot from miles away because they didn’t want anyone to see their cars parked nearby. Thanks to a rule MSHA issued in 1980, a miner whose X-ray shows signs of black lung receives a letter that requires his employer to transfer him to a less dusty job and pay him the same as before. The miner alone sees the letter, and he can use it whenever he wants. Only about 30 percent of the nearly 3,000 letters issued to miners since 1980 have been used, according to MSHA data provided to the Center and NPR. All of this has led NIOSH to believe that the resurgence of black lung may actually be worse than its numbers reveal. “We know that there is disease out there that we are not identifying because miners are avoiding participation based upon disease status,” NIOSH epidemiologist Laney said. The system for monitoring dust levels is tailor-made for cheating, and mining companies haven’t been shy about doing so. Regulators often have neglected to enforce even these porous rules. Take James Marcum: He spent his last semester of high school taking a class at the University of Kentucky because he already had enough credits to graduate. His father, having filed for black-lung benefits a few years earlier, encouraged him to go to school and stay out of the mines. Nonetheless, James took a summer job at a mine to earn money for college. “I started earning them $800-a-week paydays and said, ‘Why would I want to go to college when I’m earning this kind of money? '” he recalled, standing in the shadow of Dewey Dam at the family’s annual picnic at Jenny Wiley State Park in Prestonsburg, Kentucky. He spent about 90 percent of his 20-year mining career, he estimated, operating a continuous miner. In 1991, the motor of the machine he was running caught fire, and smoke overcame him. About six years later, James found himself back in the hospital. He’d been caught between two pieces of the continuous miner and injured his back. Alone in that section of the mine when the accident happened, he finished his shift and went to the hospital the next morning. Doctors again took X-rays, and, this time, his lungs were so bad he had to see a specialist. A biopsy confirmed that he had black lung. The youngest of the three Marcum brothers, he has shown the worst decline in lung function. At the family’s picnic, while Donald socialized and Thomas talked to their father, Ray, over plates of fried chicken, coleslaw, and potato salad, James sat quietly. The Center for Public Integrity is a nonprofit, independent investigative news outlet. This story is part of its Hard Labor series.